At Old Bazaar, customers saunter in on first-name basis with the staff, plonk down their wine and order “the usual”. 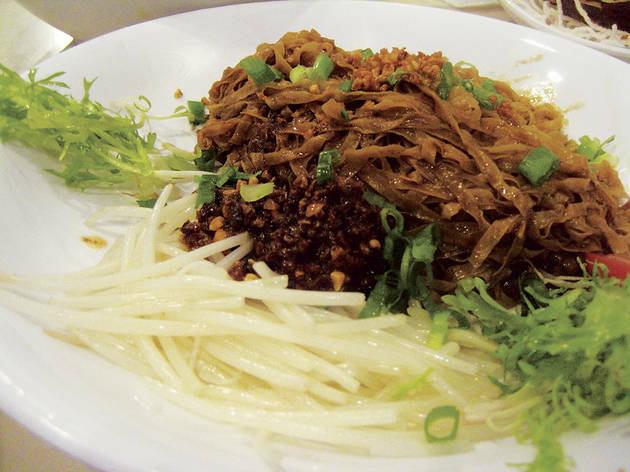 The regulars hail from the restaurant’s old Tin Hau days, when it was a firm foodie favourite until it shuttered its doors early last year. Now resurrected on the Wan Chai drag, it’s not hard to see why the restaurant’s popularity hasn’t waned at all. While most other Southeast Asian joints in town swear by the authenticity of their traditional Sabah specialties, Old Bazaar does the complete opposite, marketing itself on its unique use of ingredients and fusion play of flavours. A fresh twist on steamed meat cakes sees minced pork compacted into patties, pan-fried in shallow oil and served four to a plate over a bed of fluffy white rice ($98). Specks of anchovy add an explosive, briny binge to the whole affair. Deep-fried pig intestines ($68) arrived at the table as ungreasy bite-sized loops. The well browned pieces were crisp on the outside but still soft in the centre with a gaminess that couples especially well with sweet chilli sauce. 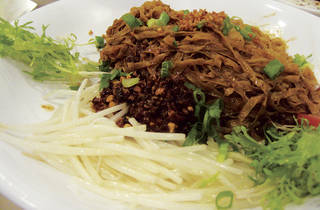 But it’s the stir-fried rice noodles with beef ($88) that stole the spotlight. Ribbons of noodles came tangled with crushed peanuts, chopped scallions, bean sprouts and a healthy dose of homespun sambal belacan (Malay style shrimp paste). It’s a delicious chorus of clean flavours that sings in the plate without weighing down the palate. Our only complaint was with the drunken goose liver ($88), which tasted a little amateurish compared to the other stellar dishes. The thick, pale slab of foie measured up to the size of a palm but unfortunately lost itself in an aggressive deluge of huadiao wine, which left the dish tasting more bitter than sweet. Old Bazaar is a great comeback effort. And while the restaurant already has a steady pool of die-hard devotees, we’re sure their fan base will continue to flourish. Meal for two: around $350.